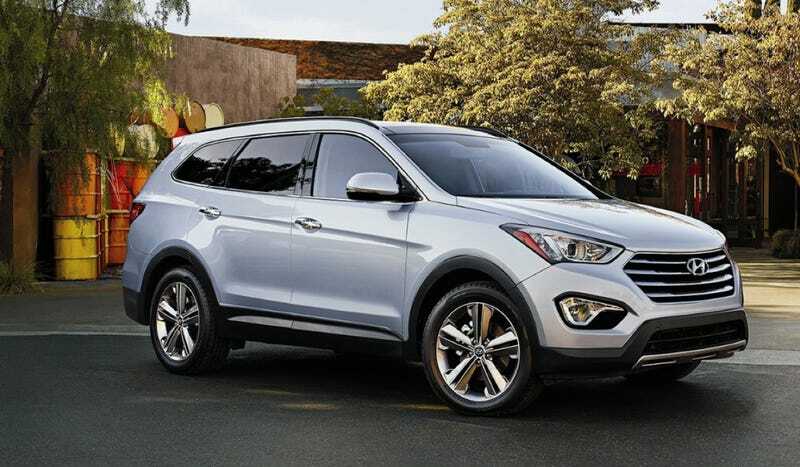 The Hyundai Santa Fe is a versatile CUV that won’t destroy your pocketbook. What do you need to know before you buy one? Don’t worry, we’ll tell you everything right here in our Buyer’s Guide. Hyundai’s Santa Fe and Santa Fe Sport join a lineup of thoroughly competent and yet thoroughly under-appreciated vehicles. Like its brother, the Tucson, the Santa Fe is not a particularly exciting car. It doesn’t come with enormous V8 engine options, and it’s not meant to tackle the Nordschleife at 10/10ths. It’s a sensible car, and, like all Hyundais, is an alternative. Yes, that’s right. Hyundais are rarely the go-to vehicle for shoppers. When people need a car, they rarely think: “Hmm. I need a vehicle today. Something like a Hyundai Tucson or Santa Fe.” No, your average CUV buyer has household names like “Pilot,” “Highlander,” and “CR-V” in his or her mind. The Hyundai only comes up when prices start getting a bit out of the buyer’s comfort zone, and that friend who knows everything whispers “Hey, have you looked into Hyundai?” into their ear. Next thing you know, she’s driving off a Hyundai lot in a Santa Fe chalk full of options for a price she just couldn’t believe. That’s the story of Hyundai. And that’s the story of the Santa Fe. The third generation Santa Fe launched at the New York Auto Show in 2012 with new sheetmetal, a revised interior, and two different bodies. That last part was the big story for 2013: the introduction of the Santa Fe Sport, the shorter version of the 3-row Santa Fe. The Sport comes with two four-cylinder options: a carryover naturally aspirated 2.4-liter I4 and a 264 HP 2.0-liter turbo I4. Both engines route their power through the only available transmission: a 6-speed automatic. The big Santa Fe comes with a 290 horsepower V6 mated also to a 6-speed auto. Neither model has changed dramatically since that 2012 introduction. Both got a few extra safety features like Blind Spot Detection and rear parking assist. The grille got a few tweaks, a hands free liftgate became optional, and a few suspension and steering tweaks were made in 2015. The Hyundai Santa Fe comes in two versions: There’s the Santa Fe Sport, and just the Santa Fe. The Sport is the shorter, 5-passenger version, while the regular Santa Fe is 8.5 inches longer, has a unique fascia, and offers a third row and seating for seven. The 5-passenger Sport starts at $24,950, while the larger Santa Fe starts at $30,400. Each gets two trim levels. The Santa Fe comes in SE and Limited trims, while the Santa Fe Sport comes in Sport and Sport 2.0T flavors. If we were buying the Santa Fe Sport, we’d gun for the base model to maximize fuel economy and keep our wallets from depleting. $24,950 isn’t bad for a decently-sized SUV with alloy wheels, air conditioning, projector beam headlights, keyless entry, heated power mirrors, and a reputation for quality and reliability.